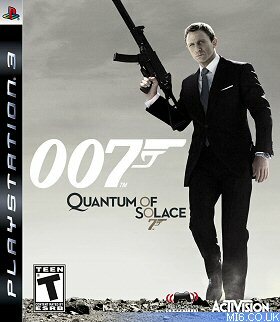 This walkthrough guide is for the PS3, Xbox 360, PC and Wii versions of "Quantum of Solace: The Game". Click the mission in the list below for the relevant section of the players guide (grey indicates 'coming soon'). Begin eliminating the snipers on the lower level. One can be found beneath the poster. Two others will be found to the left and the right, patrolling the building corners. Eliminate the snipers on the upper level. There is a faint white light in the building’s middle portion. Eliminate the sniper there. Two other snipers can be found near the faint red lights to your left and right. Turn behind and proceed to the opposite end of the area. Exit through the only corridor. The game will automatically leave your rifle behind. Equip your silencer and eliminate the guard in front of you. Proceed forward and eliminate the patrolling guard. Proceed further and eliminate the guard working with the laptop. Proceed along the truck’s right side and you will encounter a right-side door locked via keypad. Hack the keypad and enter. Enter the left-side room and eliminate the patrolling guard. Eliminate the second stationary guard and take cover behind the boxes. Eliminate the guards near the car. No matter what, an elite squadron will enter. If possible, try to eliminate as the guards when they exit from the van. If this cannot be done, they will take cover behind the cars. Beware of guards flanking your right side. Approach the farthest 18-wheeler truck. On the right side is a ladder. Climb the ladder to reach the base of an ascending staircase. Proceed left – an enemy will soon burst through a door. Enter the room he came from and open the yellow case to discover a D.A.D. rocket launcher. Exit the room and ascend the staircase to your right. Upon reaching the top of the ascending staircase, climb the ladder and climb over the right-side guardrail. Shimmy across to the pole and climb it. Take cover behind the funnel-like device to eliminate the enemies safely. Proceed the only way you can. (The direction depends upon where you took cover.) Proceed to the opposite end of where you first approached this area. Upon doing so, turn right to discover a new roof portion. Take cover behind the large unit and eliminate the three enemies also under cover. Afterward, a helicopter will appear. Do not eliminate it – you cannot. Eliminating it is a later part of the mission. Eliminate the enemies, proceed to their position, and turn right. Take cover and eliminate the guards. Jump over the vent and take cover behind the large unit. Eliminate the snipers and other approaching enemies. Follow the straightforward path until you emerge upon a large area where a helicopter will soon appear. Destroy the helicopter with well placed D.A.D. rockets if possible. If you did not obtain the rocket launcher, one to two magazines of rifle ammunition will do the job. Be wary of flanking enemies – at most, there will be two or three. 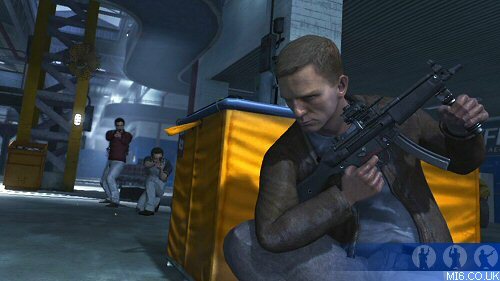 While they do not pose a significant threat on easier difficulty settings, they must be dispatched quickly on higher settings. They can usually be found on the opposite end of where you first entered the boss arena, or near the small ascending staircase near the building. Sprint to the end of the corridor, turn left, descend the small staircase, and eliminate the guard. To the right of the doorframe leading downstairs is a camera box. Patch into the cameras and head downstairs. When you approach the closed door at the base of the stairs, it will open automatically. Take cover behind the wall. If you accomplished this section quickly enough, you will see two guards approaching each other and later conversing. Take note of the security camera across the room. On the right-side wall across the room is a doorframe. When they exit the room and enter the doorway you will soon enter, sprint across the room and enter the doorway. Avoid the camera. Eliminate the guards inside. Inside this room are two locked door requiring hacked keypads. Upon unlocking one door, the other will unlock automatically. Unlock the left-side door and take cover. Eliminate the enemies inside. If needed, take cover behind the right-side wall to eliminate enemies. During this fight sequence, the left and right-side doors to the next room will momentarily open and later close. To proceed to the next room, walk on the last catwalk. You will see a “walkway” consisting of pipes. Walk across the pipes to reach the second room. Inside this room, locate the small ladder that leads to a ventilation shaft. Enter the small ventilation shaft and slide down the rope. Enter the room. If you reached this room late enough, the left-side double doors will be locked via keypad. Hack and keypad and proceed through. Directly in front of you is a camera patch box. Patch into the cameras and head left. You will soon come to a corridor with a yellow-white wall. Do not enter the rooms but instead follow the main corridor. Be wary of the one security camera that exists here. When first entering this sequence, take cover behind the first wall that forms a right angle. From here, you see the security camera. Sprint and crouch directly below the camera. When it looks away, proceed forward and left. You will enter a similar section with red-white walls. Proceed through this corridor without entering the rooms. You will soon enter a small office complex with a large computer station. Access the elevator using the computer. Ensure you have a good long-distance automatic weapon before entering the elevator. Upon reaching your destination in the elevator, the doors will briefly open but soon close. During this period, eliminate visible enemies. The elevator will begin crashing. On the ceiling is an escape hatch. Wait for it to open and quickly proceed through. Upon reaching the top of the elevator, quickly climb the ladder leading to your destination. If you do this too slowly, you will die from the explosion resulting from the crashing elevator. Upon reaching the top floor, quickly take cover. Cover during this portion is essential. What you wish to do throughout this is proceed to the opposite end of the exhibit room on the first floor. From the cover, eliminate as many enemies as possible and proceed forward to another cover station. From there, eliminate more enemies. Rinse and repeat. Enter the hallway leading left and take cover behind a pillar. When the enemies stop, turn right and proceed to the hallway that (from your position) leads left. Take cover behind a pillar and eliminate enemies from there. Behind you is a yellow case contacting a TLD-22. Obtain it if needed. Return to the left-side hallway and descend the staircase. Upon reaching the bottom, take cover behind a pillar and eliminate enemies. Be wary of enemies from the left and right on the (slightly) upper level attempting to attack you. Proceed halfway across the room and enter the left-side (slightly) upper level. Eliminate the enemies here. Eliminate all enemies. Be wary of enemies approaching or firing from your right side. Upon eliminating enemies on the left side upper-level, eliminate enemies on the right-side upper level. Upon eliminating the first squadron of enemies, a second will appear. Steadily proceed to the opposite end of the exhibit room. Upon eliminating all enemies, this section will unlock. Inside will be an enemy. Eliminate him to complete the mission. Head downstairs and take note of the camera directly in front of you. Avoid the camera and head right. Afterward, turn left and head forward. You will soon see a large office surrounded by bulletproof glass and locked via keypad. Unlock the door and hack the computer. To your right is a newly unlocked door. Wait for the guard to enter the office and eliminate him. Exit the office and turn left. Turn left again, shoot the guard, and take cover behind the wall. The guard’s death will alert other enemies. From your cover position, eliminate all guards. Proceed to the opposite end of the room and turn left. At the end of the corridor is a room similar to the one where you hacked the first computer. Unlock the door and hack the computer. The door to your left that was previously locked is now open. Proceed through and take cover behind the cubicles. Take note of the security camera to your left. Ignore the camera, head forward, and then right. Take cover behind another cubicle. From this position, you should see another security camera. The security camera power box is found directly to the right, on the side of the pillar. Deactivate the camera. Hack the door to the left of the security camera. Hack the third computer. Upon hacking the computer, the locked doors to your left and right will open. Exit via either door and immediately take cover. Eliminate all enemies. Be wary of enemies that may flank from your left or right, depending on your position. Upon eliminating all enemies, exit the room via the doorway at the opposite end. Turn around the truck, head upstairs, and take cover behind the wall. 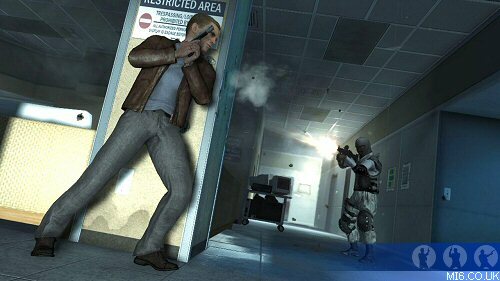 Eliminate as many enemies as possible from that position and take cover behind the left-side windows. This is another section where cover is essential due to multiple enemies in multiple positions. Eliminate as many enemies as possible from this position. Be wary of enemies flanking from your right. When you can no longer attack enemies from this position, proceed downstairs (the door downstairs is found on your right) take cover behind an appropriate setting, and continue from there. Upon eliminating most or all enemies, locate a portion of the garage that slopes downward to a new section. From there, turn right. Climb over the baggage and over the fence. This section is another where cover is essential. Take cover behind the medium-sized blue box and eliminate the enemies on the catwalk first. Afterward, proceed across the room taking appropriate cover to eliminate enemies. Proceed across the room. You will see a doorframe that leads outside where a white truck is stationary. To the left of that is a ladder you must climb. After climbing the ladder, immediately take cover and eliminate enemies from your position. When this position is no longer viable, follow the catwalk left to descend to the lower level. On the lower level, proceed across the room eliminating enemies as you go. Be wary of enemies that will make a mad dash for your position or attempt to flank you. Across the room is a set of garage doors. Between garage doors two and three (counting from the left) is a switch. Activate the switch and a cinematic will automatically show Bond proceeding outside. Ascend the blue staircase to your left and eliminate the bomber. He hides behind cover (behind the cars used for passenger luggage) but quickly dashes for different positions. Eliminate him to complete the mission. "Quantum of Solace" campaign players guide by Lethal Weapon for MI6. All rights reserved. The players guide is for personal use only and may not be republished without prior permission. MI6 can not be held responsible for any errors or omissions from the campaign mission walk through or gameplay tips.